Every Tuesday evening around 5 p.m., the cushions on my couch in my living room take hold of me with this magnetizing effect of sucking me into an almost permanent state of lounging. And every Tuesday evening at 5:15 p.m., I have to pull myself free from the super glue and go back to work. I’ve already wrestled with attempting to educate – usually successfully – hormone-riddled sophomores and seniors at Mammoth High School with a lesson about anything from Simon Bolivar’s leadership during the Latin American Revolutions to discussions about the various forms of government taxation. But the work day for me ain’t over yet. I rub the dogs behind the ears, ask myself why I’m going back to work for the evening when I already knocked out a good day, and head off down the road to the public library. I started teaching English as a second language (ESL) over twenty years ago. When my fellow Chico State alum bolted off to the Bay Area in the late 90’s to make a killing in the tech industry, I boarded a plane to Romania where I committed to two years of teaching English to non-native English speakers in a small village in Central Transylvania. After service in the Peace Corps, I landed a three year gig at a middle school in southern California before coming up to Mammoth High School in 2004 as an ESL teacher. I hadn’t taught ESL in the high school classroom for several years now, focusing exclusively on the social sciences. So, when I noticed an advertisement in the local paper in April 2016 from the Mono County Office of Education (MCOE) soliciting a very part-time teaching role for an adult ESL class, I put my name in the hat. They hired me. I was going full circle back to my roots. I didn’t know what to expect, teaching adults in the afternoon. All I knew was that I was going to help non-native English speakers learn the language. So, who are my students? The typical class has around eight to twelve students. These are working adults, so the other demands of life sometimes interfere with the opportunity to come to every single session. Most learners have a minimal to basic command of the English language. I have a few students, like Juana Olmos, who has a fantastic understanding of the language. Everyone learns at different rates, so they all get something different out of every lesson. Most of these adults are parents with kids in the local school system. It’s not uncommon for me to teach the child and parent of the same family on the same day. Watching the young-uns after school was always a top priority for some parents which hurt attendance. I commend my supervisor Shana Stapp for recently hiring a child care assistant who watches offspring while I teach the adults. This has boosted attendance. The lessons focus on the four language skills of listening, speaking, reading, and writing. We target survival and commonly-used vocabulary. There is no getting around grammar lessons. Anything from the conjugation of verb tenses to the proper use of subject pronouns. English is a language riddled with irregularities. Teaching it is not without its challenges, but it can be done. The lessons involve a variety of resources ranging from answering questions in traditional workbooks to watching LCD-projected lessons. Students are regularly assessed to gauge progress. Informal analysis also tells me that the students who regularly attend demonstrate progress of acquiring English. It’s very rewarding for me to help adults who want to better themselves by learning the language spoken by the majority. I’m not the only teacher. 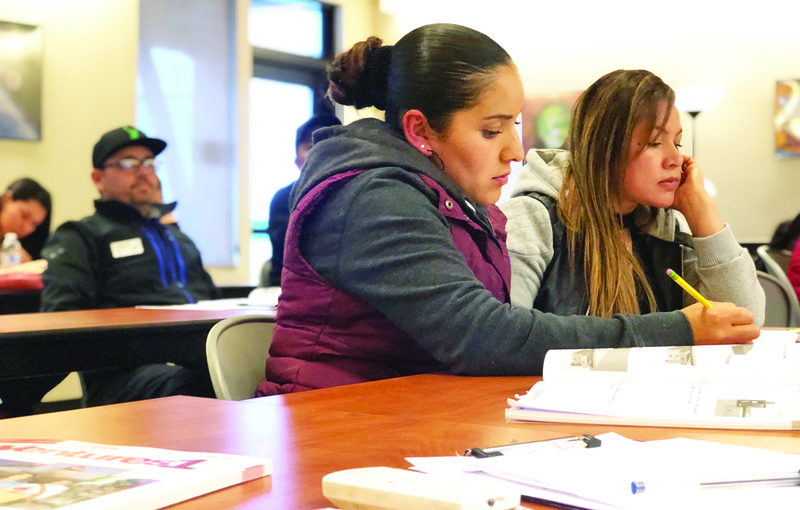 The adult ESL course is offered Tuesdays and Thursdays from 5:30– 7:30 p.m. Tuesdays – my assignment – concentrate on the beginning level. Anna Kinsey Ceruti teaches the more intermediate group on Thursdays. There is also an adult literacy class taught Monday evenings by Rose Kuljerich. And Nick Stavros teaches Spanish on Wednesdays to people who want to learn Spanish. All courses are funded by MCOE, and there is no cost for anyone who wishes to participate. I commend MCOE for offering this to our community. More importantly, I salute the adults who make my Tuesday evenings enjoyable. It’s worth getting off the couch for. These courses are open to anyone who wants to show up. The fishing guy. Professional instructor of fly fishing for trout, and wordsmith extraordinaire.